High Strangeness: Crop Circles! Finally! Finally, I am writing about crop circles! I have a thing for crop circles. Crop circles are strange and wonderful images -- usually circular but not always -- that mysteriously appear in farm fields when no one is looking. They're created by the systematic flattening of crops by forces unknown... They've been a big deal in southern England for decades, where they appear all over the landscape every summer. Crazy, right? 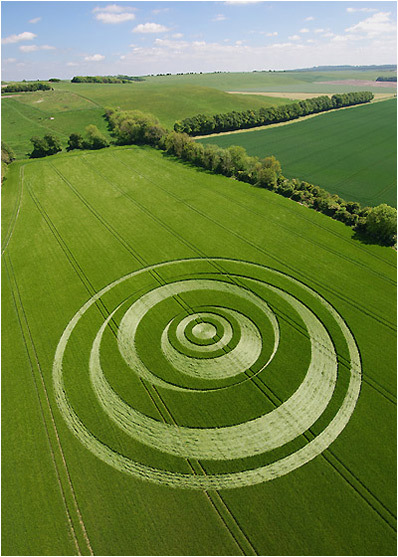 This circle appeared overnight in May, 2007, in England. 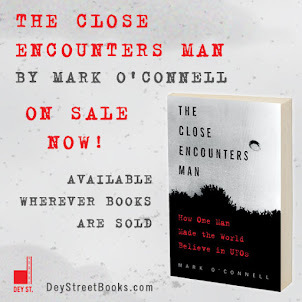 I got into them when I first learned the story of Doug Bower and Dave Chorley, a couple of old British blokes who became world famous in 1991when they took credit for creating every circle that had ever appeared in England. That was clearly impossible, but the British press was so happy to have a reasonable explanation they went with the story and made celebrities of Doug and Dave. I thought the story was so charming that I wrote a screenplay about it, and back in 2006 it looked as though the movie might get made at Disney with Bill Paxton directing. That didn't happen (although someone named M. Knight Shyamalan made a dopey alien invasion movie around that time that had crop circles in the story), but people still get excited about the script every now and then and I have maintained an interest in "cereology," which has nothing to do with Cap'N Crunch and everything to do with the study of crop circles... Mostly I just like them because they're so beautiful and so strange, and nobody has ever come up with a better explanation for them than Doug & Dave. This brings up some serious questions, such as, should we investigate something that doesn't necessarily involve UFOs? I say yes, because Bigfoot. Also, should we stick our noses into something that the US Air Force is already involved in? I say yes to that too, because I simply don't believe that the US Air Force Special Crop Circle Investigation Unit exists. Because I don't believe that the US Air Force would ever form an investigation unit with such a stupid, obvious name. If you were the US Air Force and you were going to form a special crop circle investigation unit, would you call it the Special Crop Circle Investigation Unit? No, you would give it a clever -- but not too clever -- decoy name, like the US Air Force Directorate of Unremarkable Tedium. Or Unit 9. Or CROPCOM. If we do end up investigating crop circles I'll be a very happy guy. 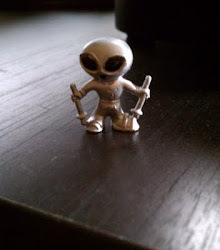 And if there is a connection between crop circles and UFOs, you'll read it here first.